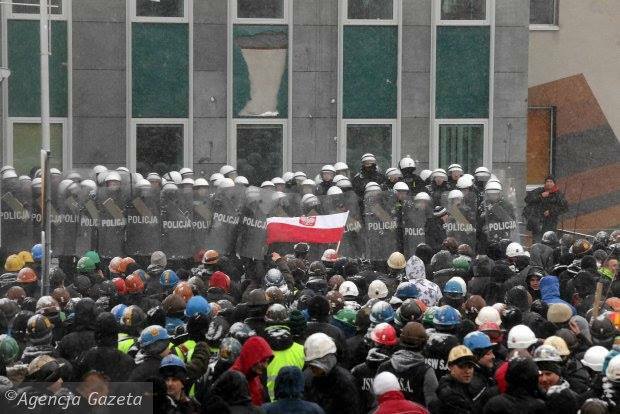 On February 21, 2015, anti-globalization activists from across the Polish political spectrum gathered in the building of the Polish Teachers’ Union in Warsaw for the founding congress of the new political party, Zmiana (Change). Despite derision by the Polish corporate media as the “Russian Fifth Column in Poland,” “Putin’s little green trolls,” and “little red idiots,” and notwithstanding political harassment by the Young Greens who strove to ban the congress from the All-Polish Alliance of Trade Unions building, and also in defiance of the presence of the Ukrainian SBU outside, more than a hundred activists proudly assembled to launch a new party of tremendous importance to the Polish political scene. Despite his being denied entry into Poland, the triumphant gathering of Zmiana was still pleasingly greeted by a video message from the Minister of Foreign Affairs of the Donetsk People’s Republic. from various union, socialist, and anti-imperialist organizations. Piskorski may be a familiar personality to those fighting for a multi-polar world, but his new party has yet to receive the attention it deserves. Lech Walesa, NATO’s Trojan Horse. Lech Walesa, the main architect of Solidarnosc, (Solidarity) became a tool for Western penetration of the Soviet/Russian sphere. Lech Walesa, Solidarity’s leader, may have been instrumental in the first color revolution in Europe. His Wiki page, glowing with badly-repressed admiration, has all the “signatures” of an anti-Soviet/Russian propaganda job written by the usual hidden assets. “Polish politician, trade-union organizer, philanthropist and human-rights activist. A charismatic leader, he co-founded Solidarity (Solidarność), the Soviet bloc’s first independent trade union, won the Nobel Peace Prize in 1983, and served as President of Poland from 1990 to 1995.”, declares the page breathlessly. Too many coincidences, including the Nobel, which, as we now clearly understand has long been manipulated by Washington for propaganda purposes. It’s worth noting that the evil communist government, who obviously knew of his activities and kept him under surveillance, never murdered him in cold blood, as is the case with thousands of trade union activists throughout the US client state network. In Guatemala, Indonesia, or El Salvador, Walesa, the fighter of “communist tyranny” would have been disappeared in a matter of days. Those facts never entered the heads of Eastern Europeans sold on the Western pied piper song. In the end, Walesa did deliver his country to the empire: “During his presidency (1990-95, parallel to Boris Yeltsin’s Western-dominated disastrous regime in Moscow ) Wałęsa saw Poland through privatization and transition to a free-market economy (the Balcerowicz Plan), Poland’s 1991 first completely free parliamentary elections, and a period of redefinition of Poland’s foreign relations. He successfully negotiated the withdrawal of Soviet troops from Polish soil and won a substantial reduction in Poland’s foreign debts. Wałęsa supported Poland’s entry into NATO and into the European Union. Both these goals would be realized after his presidency, in 1999 and 2004, respectively. In the early 1990s, Wałęsa proposed the creation of a NATO bis as a sub-regional security system.” QOED. Concerning Marxism, by removing the subject of class and the world view of historical materialism, one still has for appropriation Marx’s brilliant and thorough critique of capitalism, an analysis which is vital to understanding the fluxes, structures, and underpinnings of capitalism. Similarly, upon removing the nation or race as the determinant, judgmental subject with its explicitly racist pretensions from Fascism, one can critically annex the important concepts relating to ethnosociology which explore the importance of ethnic and national communities to human interaction, civilizational types, and the history and role of “the people” as an identity. There is no doubt that Zmiana is a party of Polish patriots who are fighting on behalf of the Polish people, but if the party views Moscow as an ally in such a struggle, it must recognize, contextualize, and defend this appraisal. Obviously, however, any sort of such a “pro-Russian agenda” can only be formed upon first answering the deep questions of the identity of Poland and the Poles and summing up the experience of practical political struggle. J. Arnoldski is a student of Eastern European history and an American-born activist of Polish and Russian heritage currently based in Wroclaw, Poland. Formerly an activist in the American communist movement, he currently works as one of the founders of International Students Aid to Donbass. His expertise and interests include Russian history, with a specialization in the Soviet period, Eurasianism, and the Fourth Political Theory of Alexander Dugin. Copyright © Center for Syncretic Studies 2015 – All Rights Reserved. No part of this material may be reproduced for commercial purposes without expressed consent of the author. Contact the Press Center to inquire. For non commercial purposes: Back-links and complete reproductions are hereby permitted with author’s name and CSS website name appearing clearly on the page where the reproduced material is published. Quotes and snippets are permissible insofar as they do not alter the meaning of the original work, as determined by the work’s original author. Posted in ACTIVISTS & ACTIVISM, AMERICAN PROPAGANDA, AMERICAN STUDIES, ANTIFASCISTS, CAPITALISM & SOCIALISM, COUNTERPROPAGANDA & TRUTH, CULTURAL POLITICAL ISSUES.